The Kinsel family enjoys a long history of cattle ranching and game management. The Kinsel Cattle Company has successfully conducted a game management plan which has produced some of the best Whitetails in the area. The deer are fed free-choice protein year round. Additionally the deer are fed corn from October through January. The preferred hunt will be from elevated blinds and enclosed tri-pods, overlooking automatic feeders, or "Safari-Style Walk and Stalk", as well as rattling during the rut. Prior to our first hunt we will spend about 45 minutes going over the ranch rules and looking at management and mature deer photographs, so that we will all understand what we are looking for in the pasture. We require a release of liability form be signed prior to the hunt. Hunters are required to have and wear snake boots, leggings, or wrap-arounds, as there is always a possibility of Rattlesnakes. Hunts may be arranged around your schedule, however, a typical hunt begins at the ranch on Friday at 2:00 p.m. where we will give you a quick overview of the ranch, and sight in your guns if necessary. Then it's off to start an exciting weekend of South Texas Deer Hunting. The following morning we will begin our hunt around 6 a.m. The morning hunt will end by 11 a.m. We will start at 3 p.m. for the afternoon hunt. The time period between 11:00 a.m. and 3:00 p.m. is your time to spend in Cotulla, maybe taking a nap, eating a lunch, catching some of the game on T.V. or shopping at the world famous Ben's Western Wear for a new hat or boots. If you prefer to stay at the ranch, you are welcome to do so. The hunts will end at 10:00 a.m. on the third day, which encompasses four hunt outings, two morning and two evening hunts. In order to keep you on schedule for departing at noon, the rest of the morning will be spent processing your game. Field dressing will be done by the guides. We have a large walk-in cooler to keep your game in during your stay. Hunters will be responsible for quartering any game that is to be transported home. If you wish, the guides will quarter your game (hams, shoulders & backstraps) for you for a fee $25.00 per animal. (Hunters must provide ice chests). It is a strong suggestion, to avoid any delays or miscommunication, that the hunter make arrangements for any and all taxidermy work prior to the hunt. Hunters are responsible for caping-out their trophy. The guides can cape-out and transport to San Antonio for a fee of $25.00 per animal. All arrangements for processing, taxidermy work, shipping, and payment, will be between the taxidermist and the hunter. Snake Leggings or Snake Boots, Binoculars, Camo Gloves, Head/Face Mask, Flashlight, Knife, Camera, Boots, Rubber Boots, Hunting License, Light and Heavy Coat, Firearm and Ammunition. javelinas, and coyotes, if seen. Trophy Charge as per the below table plus guide fee. 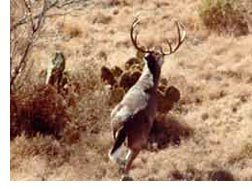 The description of the management buck varies and the guide will make a determination based on age and genetic potential. A typical management buck will be a mature buck, 5 1/2 yrs. or older, scoring up to 140 gross B&C Inches, usually having eight main points. Most of our management bucks have a 17" inside spread. To continue improving our overall herd, any management bucks having forked tines, outboard points or drop points below the main beam, will be harvested on a limited basis. A very important part of managing any deer herd is the harvesting of does. The hunting package includes the taking of two does. If you do not wish to keep the meat, we have several charities we will donate it to, so we encourage you to help us keep our doe population in check. Droptines are $500 per inch. A buck is scored and priced without the droptine, and then the droptine is measured and added. Guide Fee: $300 per day per hunter. On occasion a guide must accommodate up to two hunters per guide. The hunter without a guide for that outing may harvest does, hogs and coyotes only. Observer guest fee $100 per day. Referrals: Instead of us spending a lot of money on marketing, we wish to offer to you a referral fee of $500 on a Whitetail Management Package harvest fee collected from a first time with us hunter. If you bring 5 friends that harvest a management deer earning you a $500 credit each, your $2500 management is free! Lodging: Subject to Availability. $200/night no meals. $300/night with meals. 16 and under free. Prepay and Refund Policy: All hunters will pay anticipated guide, lodging and harvest fees upfront prior to first outing. A hunter will be refunded his prepaid management or trophy harvest fee minus his deposit if the hunter does not harvest or wound an animal at the sole discretion of a Kinsel Cattle Company representative. The deposit, guide fee and lodging expense are non-refundable. Wounded Game: If at the discretion of the guide a hunter wounds a deer, it may be considered a kill wheras the harvest fee of the estimated B&C score per the guide will apply. Retrieval efforts by KCC on foot or horseback will be attempted. Fortunately, a couple of the best deer trailing dog handlers are within one hour of the ranch, and the hunter may request their services at the hunter's expense. Kinsel Cattle Company reserves the right for the guide to disallow the harvest of any particular animal(s) and to cancel any hunt at any time. A portion of the ranch is populated with Trophy Axis. 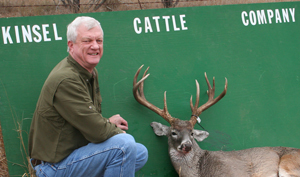 Kinsel Cattle Company, unique to many other hunting operations, always offers the hunter at the same price the option of either the Whitetail Management Package or the largest Trophy Axis we can find. Other Exotic specie hunts and prices can be arranged on other ranches. 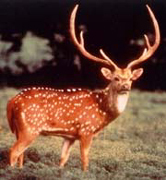 Reddish tan with white spots and large three-tined lyre-shaped antlers. A super trophy Axis male will average about $2,500 plus $300 per day per hunter guide fee. A hunter can opt for this fee regardless of measurement and harvest the largest available trophy Axis male we can find. SPECIAL PRICING: During the off-season months (March 1st - October 31st) we have an excellent supply of trophy Axis, but it can be HOT down here in South Texas. To encourage off-season hunting during this time of year we offer a Special $1,250 harvest fee on a trophy Axis of your choice plus a $300 per day per hunter guide fee.